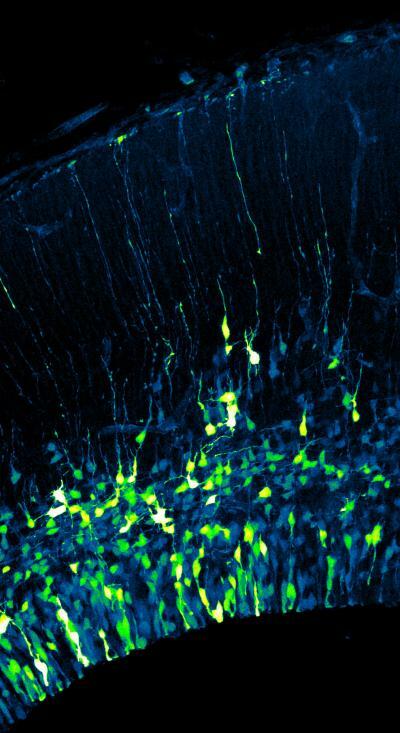 IMAGE: Duke researchers show that slowly dividing neural stem cells generate aberrant stem cells and neurons, which may have implications for neurodevelopmental disease. DURHAM, N.C. — Duke University researchers have figured out how a developmental disease called microcephaly produces a much smaller brain than normal: Some cells are simply too slow as they proceed through the neuron production process. Published online Jan. 7 in the journal Neuron, the findings provide not only a new mechanistic explanation for microcephaly, but they could also aid understanding of autism or other neurodevelopmental disorders that are thought to arise from disruptions in the proper balance of neurons in the brain. "This study shows that the time it takes for a stem cell to divide matters during brain development," said Debra Silver, an assistant professor of molecular genetics and microbiology at the Duke University School of Medicine. "But beyond microcephaly, I think it's going to be relevant for thinking about how stem cell dysfunction can change the repertoire of other cells in the body." Microcephaly is a rare disease that causes intellectual disability and seizures. A genetic form of microcephaly manifests as the fetal brain develops during pregnancy; the cerebral cortex, a large brain structure responsible for abstract thought, memory and language, is particularly vulnerable to the disorder. In 2010, Silver's group discovered that mice missing a single copy of a gene called Magoh have severely reduced brain size reminiscent of genetic microcephaly in people. "At the time, we really didn't know why," said Silver, who is also a member of the Duke Institute for Brain Sciences. The group zeroed in on neural stem cells which divide to form either a new stem cell or the beginning of a new neuron cell. The 2010 study found that the number of neural stem cells seemed out of balance with the number of neurons being produced in the Magoh-deficient brains. The researchers suspected that the time it takes for one stem cell to divide into two — a process called mitosis — could be responsible for the imbalance. Other microcephaly-linked genes are known to control mitosis. But how mitosis defects caused microcephaly was unknown. In the new study, Silver's team found that about 30% of the stem cells in mice lacking Magoh took longer — in some cases two or three times longer than usual — to divide. As scientists watched those cells using cutting-edge live imaging techniques, they were surprised to see that the sluggish stem cells tended to differentiate into neurons, and were also more likely to die. "It's really a combination that helps explain the microcephaly," Silver said. "On one hand, you're really not making enough new stem cells, and if you don't have enough stem cells you can't make enough neurons in the brain. On the other hand, some neurons do get made, but a lot of them die." Silver's team saw similar results (premature differentiation and death) when they extended the process of cell division in genetically normal mice using two different drugs. And further experiments suggest that both differentiation and death are distinct outcomes of the delayed stem cells, Silver said. Magoh is a protein that switches on the expression of many other important genes but it does not work alone. In fact, previous research has linked Magoh's partners in gene regulation to other neurodevelopmental diseases. The Duke team is now planning large-scale screening approaches to ask what other genetic pathways influence the decision point when a delayed stem cell makes a neuron. Silver's team is also exploring cell division in healthy brain development and has some preliminary data suggesting that timing matters. Studies published more than a decade ago show that mitosis takes increasingly longer as brain development progresses. "We have a really nice experimental system in place to ask about whether that could help to explain why more neurons are made as development proceeds," Silver said. The study was funded by the National Institutes of Health (R01NS083897) and the Duke Cancer Center (P30 CA014236). Suzuki, Edward Salmon, Debra L. Silver. Neuron, January 7, 2016.